It’s Day 2 of Design Improvised’s Birthday Giveaway Week! 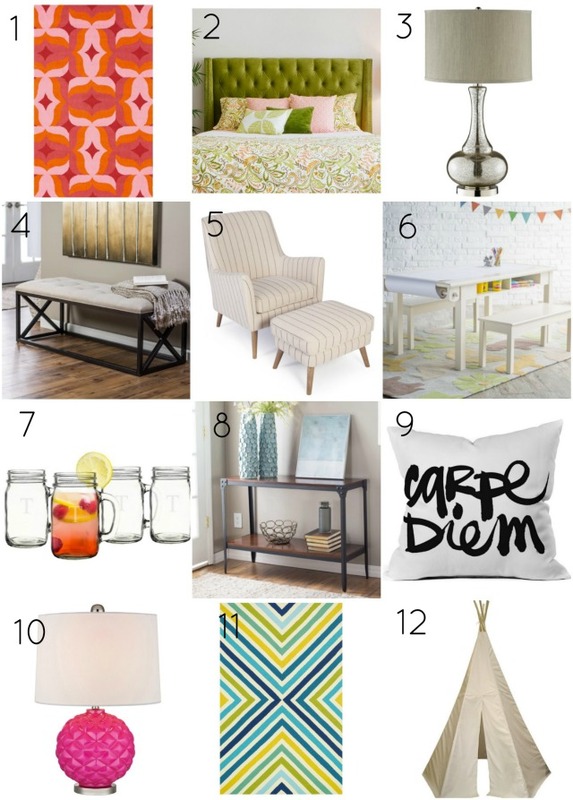 Today I have a giveaway for all you home decor lovers. I’ve partnered with my friends at hayneedle.com to give one reader a $200 gift card! I started working with hayneedle.com when we moved to our new home in San Antonio three years ago. I loved that the company was based in my home state of Nebraska and I was impressed with the huge selection of home decor and furnishings they offered across a range of styles and price points. Over the last three years, I’ve partnered with hayneedle.com on a number of design projects including these two personal favorites – Stella and Hazel’s bedroom and this guest bedroom. Read on to see my top 12 picks from hayneedle.com and to enter the giveaway at the end of the post. These products are all in our home and I can personally vouch for how great they are! However, the options on hayneedle.com are endless and I love that you can search their products by your preferred decorating style, whether its traditional, mid-century, or glam! I also find their Style Gallery section super helpful to pursue through for decorating inspiration. You can find my Styleboards here. 1. Candy Area Rug – we’ve had this beautiful bold colored rug in the girls’ bedroom for last few years and it still looks as good as when we bought it! 2. Tufted Velvet Headboard – this luxurious headboard instantly makes a bedroom feel special! I love the pretty green color we chose for our guest bedroom. 3. Gourd Table Lamp – we have these lamps in our family room. I love the mercury glass base and their substantial size. 4. Tufted Bench – such a great bench at such a great price. Perfect for an entryway or at the end of a bed. 5. Mid-Century Arm Chair & Ottoman – these chairs are trendy, comfy, and the price is right! 6. Kids Activity Table – this table may be the most used piece of furniture in our home! We have it in our family room and our girls eat their breakfast on it before school, and color and craft on it daily. 7. Personalized Drinking Jars – the perfect vessel for my morning smoothie – or an iced coffee! 8. Industrial Console Table – a sleek and solid piece of furniture for such a great price. We have it in our living room, and I use it to store board games and display family photos. 9. Carpe Diem Outdoor Pillow – I love that this is an outdoor pillow with indoor style! 10. Pink Glass Accent Lamp – such a beautiful lamp. This is on the nightstand in my girls’ bedroom. 11. Palm Springs Indoor / Outdoor Rug – I’m a sucker for bold colored outdoor rugs and this one is gorgeous. It gives our kitchen patio a big pop of color. 12. Canvas Kids Teepee – this is a quality teepee just begging for a DIY touch! Check out what I did with ours here (it involves pom-poms)! 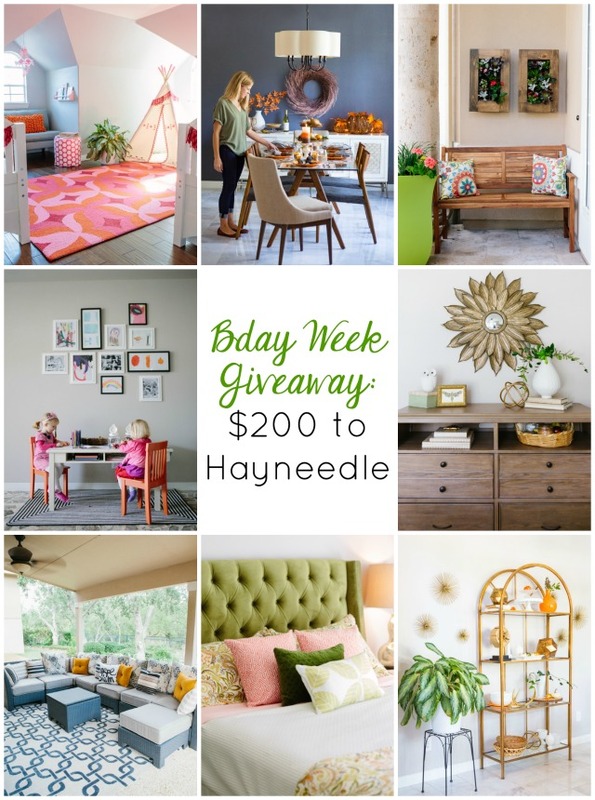 Enter to Win a $200 Gift Card to Hayneedle.com! A big thank you to hayneedle.com for providing the $200 gift card for the giveaway.